Examples, solutions, videos, worksheets, stories, and songs to help Grade 6 students learn how to convert customary units of length. 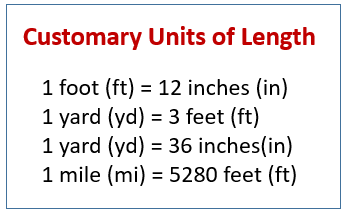 The following diagram shows the conversion table for customary units of length: inches, feet, yards, miles. Scroll down the page for more examples and solutions. How to convert customary units of length? Feet to inches, yards to feet, miles to feet, and yards to inches. Common Core State Standards 4.MD.1 and 4.MD.2.